Stacey Abrams is a proud ex-bureaucrat who also loves the novel "Atlas Shrugged"; she works with Republicans but sometimes frustrates her Democratic colleagues; she grew up on food stamps and co-founded a beverage company for children; she has worked as a tax attorney and written several romantic suspense novels on the side. That ethos has been catching the eye of many nationally. In 2014 she was named Governing magazine’s “Public Official of the Year.” In 2012 she won John F. Kennedy New Frontier Award for public officials under 40. There have been rumblings of a 2018 gubernatorial run. Indeed, in 2011, the five-term representative from Atlanta was tapped by colleagues as minority leader, the first woman to lead either party in the state legislature and the first African-American to lead in the House of Representatives. It seemed like a punishment, not a promotion. That year, eight Democrats decided to switch their party affiliation to Republican, leaving the GOP one vote shy of a supermajority. Though she was able to stave off disaster, Abrams remains pragmatic about her caucus’ ability to affect change. She has opted to work with Republicans on several key issues – most notably changes to the HOPE Scholarship Program, a lottery-funded initiative that was targeted for cuts. Abrams contends that had she not worked with Republicans, including Gov. Nathan Deal, the bill would have been worse. That is her short game. But Abrams, 42, has a long-term vision to get more Democrats and minorities elected. She helped found a voter drive called the New Georgia Project, to register 800,0000 voters by 2020 – the next time voting districts are drawn. So far the results have been mixed -- only 46,000 have registered, but she still has a goal of getting 170,000 registered by Election Day. And the project is being investigated by the Georgia secretary of state for submitting fraudulent registration applications. Abrams says she is working to patch up past problems, without quite admitting mistakes. “We learned from our past efforts,” she said. She also founded the B.L.U.E. Institute a group that seeks to train minorities to work as staffers on electoral campaigns. The Democratic National Committee has taken note – they view Georgia as a potential swing state and her efforts as helpful in getting it to closer to that status. 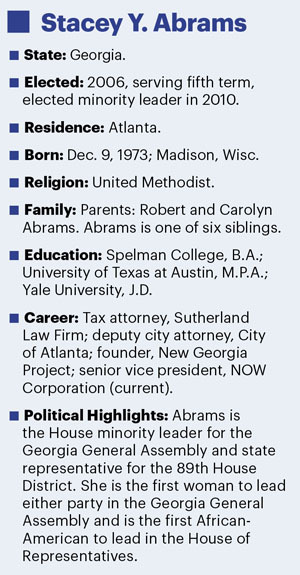 Abrams grew up the second of six children in Gulfport, Mississippi, the daughter of a shipbuilder father and a librarian mother. When Abrams was 15, the family moved to Georgia, where both her parents entered seminary to become Methodist ministers. 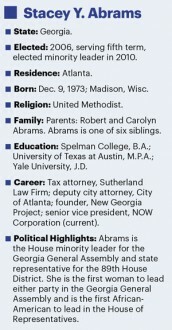 After graduating from Yale Law School, Abrams worked as a tax attorney. She later served as Atlanta’s deputy city attorney. When she first ran for her House seat in 2006, Abrams said she was motivated by her job as a bureaucrat, which she says gave her a unique perspective on the nitty-gritty of how laws are implemented. Her efforts have not gone without controversy. Some Democrats in the legislature say Abrams has spent too much time cozying up to Republicans. The Senate minority whip, Vincent Fort, said Abrams “probably meets with Republican leadership more than Senate Democratic leadership.” Abrams dismissed his concerns, saying she holds regular meetings with her colleagues. Her political ambitions (“We have these pesky elections”) seem to have interfered with her side-career as a published author: She has written seven romantic suspense novels under the pen name Selena Montgomery, but hasn’t had a book out since 2009. She says she is currently working on a legal thriller about a Supreme Court clerk taking over for a justice in a coma. Related: Mary Fallin: A Conservative Trailblazer Takes on Obama, EPA Nikki Haley’s Bumpy Road to Power See photos, follies, HOH Hits and Misses and more at Roll Call&apos;s new video site. NEW! Download the Roll Call app for the best coverage of people, politics and personalities of Capitol Hill.